Fresh herbs make any dish a standout, but my time runs short too often to chop, shred, and crush when I want food fast. These handy frozen fill-ins give all the flavor of fresh without the prep. 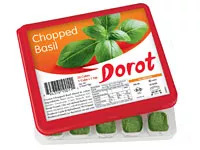 The product: Dorot herbs and spices come in trays that contain crushed or chopped garlic, ginger, basil, cilantro, chilies, dill, or parsley ($1.99-$2.99 per tray; available nationwide at Trader Joe's and select grocery stores). The taste factor: All these herbs and spices are flash frozen just after they are harvested—giving them the same fresh bite as their farmer’s market counterparts. There's no need to defrost them ahead of time. Just pop as many teaspoon-portioned cubes as you need into a fresh pasta dish, salad dressing, or soup—they thaw by the time you’re ready to serve. The health factor: You can skip the saltshaker and extra sugar that up sodium and calorie counts. These herbs add lots of flavor and pack their own nutritional benefits. Toss in extra cilantro for a flatter stomach (it’s a natural diuretic), try iron-rich basil during that time of the month (to replenish what you lose during menstruation), and add garlic for a healthier heart. Editor’s pick: Mix one cube each of basil and parsley with fresh tomatoes and scramble with two eggs for a brunch that tastes market-fresh. Why we love it: These herbs and spices season any dish with lots of bold flavor—no knife necessary—and nutritional benefits to boot.